Your correspondent managed to be in 3 cities in about a week. Wherever there are Nigerians, there will be stories to tell. (Previous editions of TWOTS can be found here). 1. “The Nigerian people paid like $4,000 for VIP tickets when they came for OTC. And then after a couple of hours, the organisers opened the whole thing so people who paid VIP and ordinary tickets were mixed together“. Everyone I spoke to in Houston complained about how badly behaved the Nigerian delegation to OTC (Offshore Technology Conference) is every year. Spending money lavishly and learning a sum total of nothing. But given how a fool and his money are soon separated, hearing this particular anecdote warmed my heart immensely. It would have been rude for the Americans not to oblige those who were desperate to be rid of their money. This was me having a conversation with a friend about Hakeem Olajuwon. 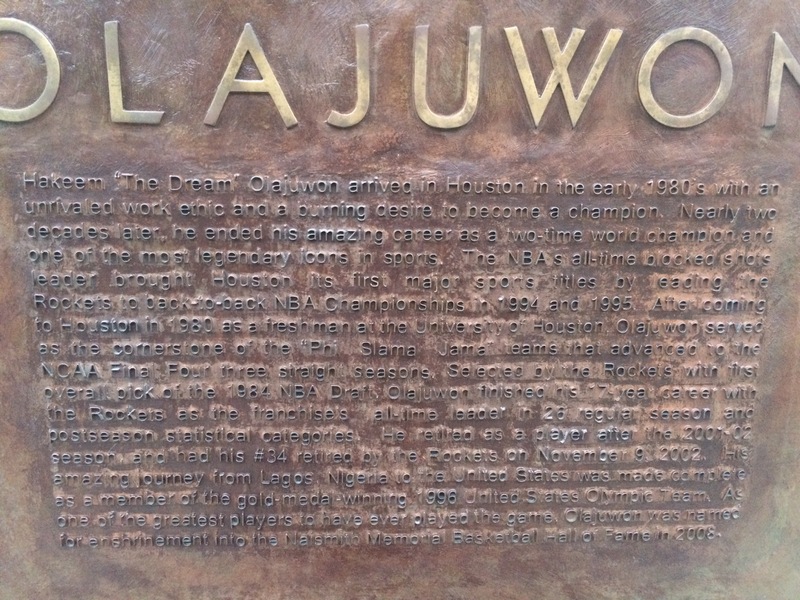 I have to say that I have never felt prouder as a Nigerian than when I was standing by the plaque to honour him outside the Toyota Centre and read the citation below. You can watch a 40 min YouTube documentary about him here. Houston made me realise we don’t celebrate this guy enough. Nigerians in Houston all seem pretty happy. Underestimate him at your own risk though. 5. Hung out with a few friends on the Transition Committee. Food was provided and I was happy to be acquainted with pounded yam again. As we sat eating, the APC Chairman, Chief John Oyegun walked in and helped himself to some food. Rest In Peace to the amala that had the misfortune of colliding with him. He devoured it with his bare hands. As we were eating, an old man walked in and took his seat at one corner of the table and started eating. It wasnt until my friend returned and said ‘that’s Tam David-West na‘ that it clicked. To put it mildly, the pictures of him regularly used by the Nigerian press seriously need to be updated. As a random aside – it was Ahmed Joda who hired John Oyegun into the Nigerian civil service in the ’70s or something. Between the two of them, there is a very good understanding of the business of processes and it shows in the work of the Transition Committee. 6. So many things are not working in Nigeria. The e-passport readers at Abuja Airport are not working. Went to about 3 clubs and restaurants and used the bathroom in 2 of them. The hand dryers were all not working. The doors at the airport with sensors to open when someone approaches are all not working. Much of the air-conditioning at the airport are not working. At the toll gate leading up to the airport, the cameras that are supposed to read number plates are not working either. It’s worth noting that these things were all deliberately installed. Do we have a problem with technology? Or do we not know how to buy technology that we need? Something makes me think it’s the latter. I stayed in a nice and small hotel in Abuja. I got into the shower to have a bath and was dazzled by how over-elaborate the whole thing was. The shower cubicle had a touchscreen with about a dozen controls for lights, temperature and even a TV. It was so confusing that when the water started coming out, it was so blazing hot that if I had made the mistake of stepping under it, I would have exited the bathroom looking like Kollington Ayinla. And I couldn’t figure out how to lower the temperature of the water after battling with the controls for about 5 minutes. I gave up and rang the reception who then sent someone to my room to sort it out. Now, I’ve stayed in some pretty decent hotels and I have never encountered a shower like that before. Perhaps I need to travel a bit more. But what are the chances that if I go back to the same hotel in 1 year’s time, the shower won’t have stopped working and I will be forced to fetch water in a bucket to have my bath? 7. You are sitting in London and hearing there is fuel scarcity in Lagos. Kini big deal? Fuel scarcities are not new and there are ways of dealing with it. But this was different…oh it was different. This was the worst fuel scarcity I have ever encountered in my life as a Nigerian. It was surreal to witness. A friend got into Lagos on Saturday from Houston and proceeded to his hotel in Victoria Island. The generator was turned off at 1am so he spent the night in darkness. I was due to meet another person in (or is it on?) Victoria Island and he said we should meet at Neo Cafe as power was being rationed in his building. In the 2 hours or so we spent there, about 4 customers came in. Each one spent maybe N2,000 and then brought out their laptops to plug and charge inside the air-conditioning – a loss making operation for the cafe. Why is anyone an entrepreneur in Nigeria? Because they are mad. Shout-out to all the mad people in Nigeria…they shall inherit the earth. That a bunch of thugs that can do this much economic terrorism to the country is unconscionable. But Nigeria put itself in this position. God only knows how many people died as a result of this complete madness. I am paraphrasing but you get the gist. This is the clash between ambition and practicality I was talking about in #5 above. When we were at Intercontinental Hotel, I noticed a friend (who knows a few things about construction) and her husband were pointing at something on the wall and discussing. I went to sit with them and they mentioned that they were trying to figure out what the thing was and what point it added to the design of the building. I volunteered that perhaps the architect put it there to extract a few more millions from them. If your village people are chasing you on 3rd Mainland Bridge and you jump inside the lagoon to get away from them, that is understandable. But when no one is chasing you and you go ahead and jump in the lagoon anyway…perplexing. Some of these self-inflicted wounds can be seen approaching from a mile away. But we walk right into them anyway. 10. Maybe because I left on a very late flight but MMIA looked rather quiet and organised. The roof was only leaking in one small spot and aside the fact that we were boiling in the heat (air-conditioning not working), everything seemed ok. But as I’ve said before, the airport is really hopeless and it’s time for a new one. Lagos state needs to step up to the plate and get going with the Lekki Airport. And I can think of one way to make it happen quicker than currently. 10,000 Indians in the diaspora funded 38% of the project – more than the state government’s 33%. It was opened in 1999 and remains one of the most profitable airports in India today. It makes intuitive sense for someone in the diaspora to invest in an airport given they are likely to have more experience of using it. Governor Ambode, sell us a bond and remove this shame of MMIA from Lagos. I left Nigeria eleven years ago and I have visited almost every year since then. Most years I visit twice. This was undoubtedly my worst trip back home. The sheer mindless suffering and pain that people were going through just to get by on account of the fuel scarcity was painful to watch. This is no way to live. Life ought not to be a pressure cooker where everyone is slowly boiling and waiting to explode. I hope that the Presidency of Muhammadu Buhari brings some real change and succour to Nigerians.